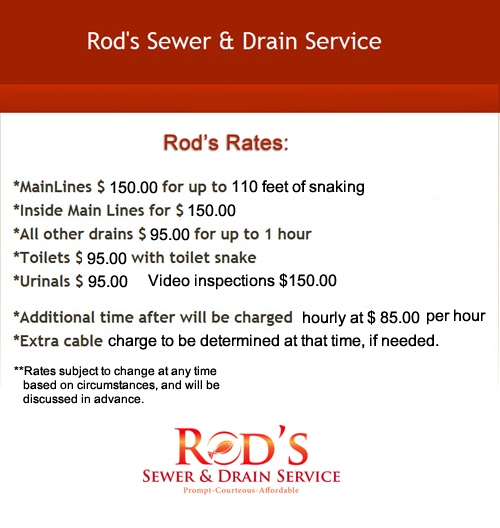 Rod's Sewer & Drain Service is the Twin Citie's best sewer & drain service, period! We are a family owned and operated business. I believe in offering up-front pricing with no trip charges. My promise is to treat your home with the same respect that I would treat my own home. I will do the job correctly, cleanly and back my work up with a guaranty. So when you need someone for your sewer cleaning and drain cleaning needs, I'll be there to get your clogged drain fixed fast so you can get back to normal in your home. A sewer backup or drain backup can happen at any time. Virtually shutting your house down. I specialize in sewer cleaning, (Rooter service) and drain cleaning, and have the experience to get your plumbing open and flowing so your home can get back to normal. So when you have a sewer cleaning or drain cleaning problem give me a call and I'll make your plumbing problems "go down the drain" at a price that wont make you cry. To me, customer service is one of the most essential things to my business (next to experience) to get the job done right. I strive to take care of each customer like they are my only one. And I try to take extra steps when in their homes to leave the work area cleaner than when I arrived to do the job. "Rod took the time to make sure everything was clean and covered. His work is fast and honest ..."